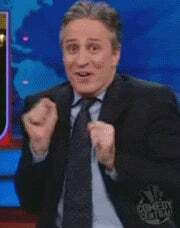 Chances are, I’ll never own a real McLaren F1. I’m all for believing in ones-self and keeping an open mind to the ever changing possibilities that the future may hold, but $9 million is a lot of cash to raise. For that reason I have more than a few diecast versions of my top contender for all-time best car ever made, ever. This is the crown jewel of my Macca assembly at the moment; a 1/12 Minichamps McLaren F1 road car. In 1/12scale. 1/12! I’ve had some of the pictures in this article for months now. The other images I’ve only just taken today. The reason for this is the same as the reason for my last post being almost two months ago! Apologies all around! Now that I once again have a functioning internet and Photoshop hub, I can bring this diecast behemoth to you, with little-to-no commercial interruptions. It is so large (and old) that I’ve had to fashion two metal accessories to hold open the doors and secondary engine cover. The other pieces all stay up as they did when new, but with time and loving use the door hinges have weakened, and I defy any of you to balance the secondary engine cover long enough to get a picture! So far as I know, only the AutoArt also has the same number of opening cavities as the 1:1. Admittedly even when bought used this Paul’s Model Art/Minichamps cost a good 20% more than the AutoArt 1/18 McLaren Road car, and I’ve almost bought the venerable AA many times. However seeing as I have a few 1/18 McLarens already, I chose this red 1/12 example, and having had this larger one to display instead has been a steady source of enjoyment without fail! 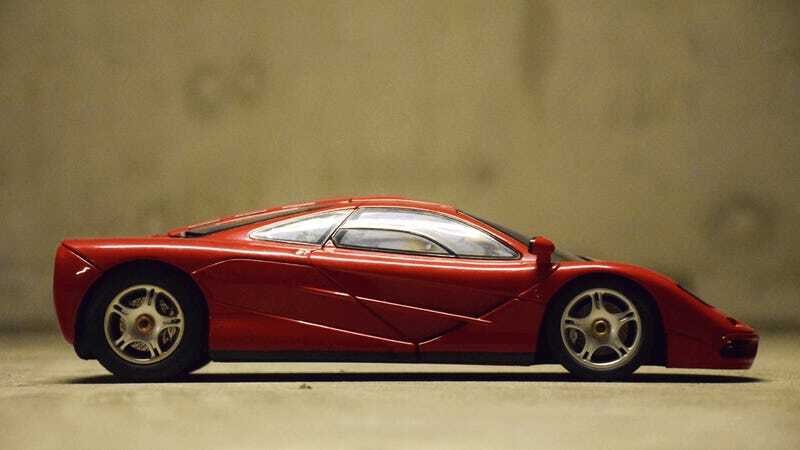 With many, if not most, diecast models, it is not a massive let down when a trunk lid or something similar doesn’t open like on the 1:1, but the 1:1 McLaren F1 has those nifty side-lockers which can hold luggage, but also conceal the fuse panel and a multitude of other electronic gadgetry that most scale models do not show us. Even the front hood (frunk? anyone?) is usually ommited and in real life that reveals attributes to simply drool over. While that is a great level of detail to have on your diecast if you are a normal human, it is almost essential if you are obsessed. Let us take a look at exactly how much bigger this thing is than a 1/18. 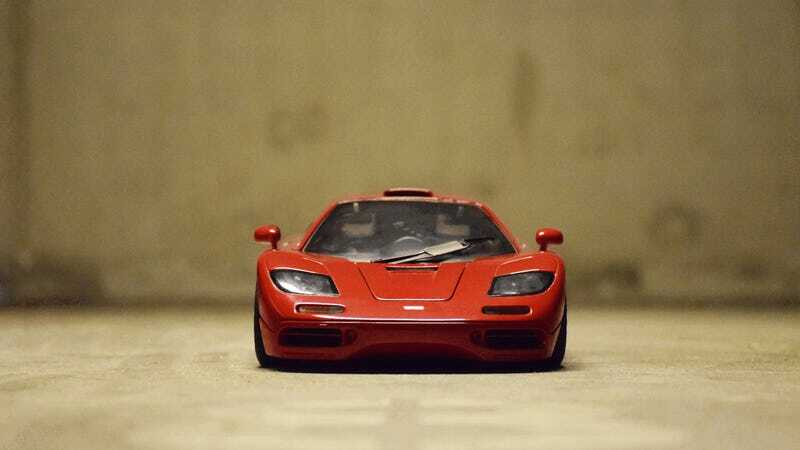 helping us out here today is a 1:18 UT Models McLaren F1 road car. A round of applause for one of the all time kings of the diecast game please. Lovely, these UT Models cars. Widely available, large variety of otherwise-unavailable car models, and more detail than the age or price point would lead one to believe. and the Maccas from UT are no exception. I found out today that the secondary engine cover on the UT Road Version opens as well! It doesn’t on the LM, GTR or Long Tail versions. It’s massive. The wheel on the 1/12 is larger than the fenderline on the 1/18. wow. I digress. Let us look at some of the details we get to see on this prodigious b*****d.
The air vent on the roof actually leads into the engine airbox here. The tires, for one, are in extraordinary detail. Not just the thread and side-lettering is spot on, but also the composition and feel of the rubber compound is in keeping with the theme of exemplary minutia here. That’s a folded up chair. Great front detail includes the aerodynamic wind vanes in the air vents, the exacting detail of the lights, wind deflector on the windshield wiper, and the hood with a separate piece for the cabin vent where most would have molded it into the hood unit. It’s the little things. Still enthralled by that central seating position. Bespoke Kenwood unit made just for the F1 application, along with A/C unit and fluid top-ups. All the engine and muffler covers open up, as does the air brake. All the mesh on this car is actual mesh. no molded plastic here! Fantastic carbon fiber details abound, and everything one could ask to have visible and on display in included here. If you can get that second cover to stay up! Here again we see that iconic yellow brace under the hood. 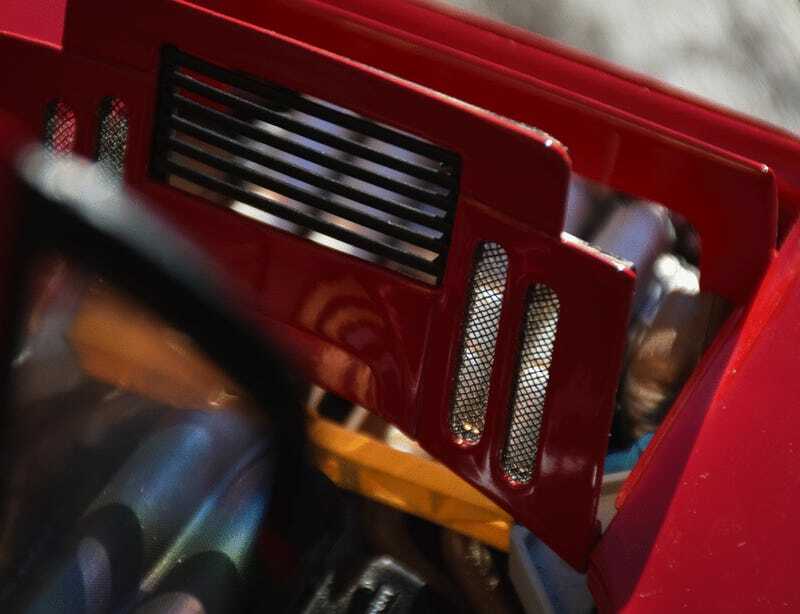 Frankly speaking, every diecast model of a Mclaren F1 worth it’s weight has this detail correct, and this is no exception whatsoever. Bonus shot of the laser-etched fuel filler cap on the flank. Some would say that this needs to be seen in large scale to really be appreciated. Here we see the fabulous detail behind those storage lockers. Nice flocking and decals, paintwork exceeds expectations for this hidden area, and there is enough space to fold up an eye-glass cleaning cloth and store it in there at all times! There is also a little silver F1 logo on each door. Enable CSI:LaLD Super Zoom Mode! Naturally, doors lead us to the interior. Cloth seatbelts, laser-etched seatbelt buckles, accurately molded components throughout, carbon fiber, minimalism, and inviting. That’s what this interior is. Lets CSI:LaLD Super Zoom around in here! Well... I think that’s about it for this one!